Older Single Mum: Micro Scooter Spares and Repairs. Micro Scooter Spares and Repairs. The Fearsome Four Year Old. This is my life: Littlest in a Wrestler's / Iron Man / Power Rangers / Buzz Lightyear suit, or, when it's super duper hot and he admits he gets a spotty botty from such synthetic stuff in the heat, we can just about get away with a totally matching shorts and t-shirt suit and, regardless of his outfit, he will be next to / riding / asking about his scooter. Charming though it is, it can be a bit wearing because he knows that it is what is taken away when he is naughty, so he's constantly checking he can ride it when we're next going out. It actually has to be locked in the car boot or he drives me mad scooting it around the house otherwise. I've tried this positive parenting malarkey i.e. rewarding good behaviour and both my boys will do almost anything for a cuddle, but hitting them where it hurts, figuratively speaking, obvs, is sometimes the only way they'll see sense. Mums on the school run raise their eyebrows conspirationally at me - not because of the outfits as we're all used to them - but because he's sauntering instead of scooting. He'll happily tell everyone he's not allowed to ride it that morning / afternoon / lunchtime. He accepts his fate with grace and dignity and he gets such joy out of riding it all the freakin' time normally that it seems a shame, but it must be done. So you can imagine my panic disappointment when the little brake at the back came off. Seeing as he hurtles everywhere, this was a categoric disaster, but being a skint and desperate single mum I continued to let him ride it with me shouting lots at him to slow down! Not exactly safe ideal. Then the Heavens opened, music emanated from the sky and the Gods sent me the lady from Micro-Scooters Spares. They sell new parts for all their scooters, including brakes with divine instructions for £5.95 with free p&p. Grateful does not begin to describe it. Unbeknown to me, you can revamp the entire things with new bearings, wheels or completely new decks and it seems, nowadays, none of them are complete without some of their fancy accessories - handles and bags and water bottle carriers, for example - they're well worth checking out, as is their brilliant idea of a Scoot Safe Scheme! Delighted does not begin to describe it. In return for writing about them, they said they'd send Littlest a new scooter anyway, and I tried, unsuccessfully, to resist, which, as it happens, proved to be a good move, because, being by the sea, some rust had set it around the screws and this made it too tricky for me to replace the brake myself. When you're the main mode of transport for a Wrestler / Iron Man / any of the Power Rangers depending on the day and Buzz Lightyear day in, day out, year in, year out, I suppose some heavy wear and tear will occur, but all may well not be lost as Micro Scooters Ltd. is asking for donations of old/unwanted/unused ones so that they can repair them and send them to good causes in the UK & Africa. I thought he'd literally loved his old one to death and relief at being able to replace it does not begin to describe it either. He's not the only one who enjoys the power that comes with his scooter! [Disclosure - we received a new micro scooter in return for writing about their fantastic repairs service, but all words and pics are my own, obvs.]. That's very helpful, I didn't know that you could buy the spare parts for the scooters. My son's has been going strong for a couple of years, but I am worried that it's not going to last forever, he uses it so much! Am so glad Jenny - I had no idea about all their extra stuff - really good to know and I worried too. Talk about a Heaven sent email! It should come with a gumshield and elbow pads, I feel. It's not so bad when the brake is working! Er, yes, absolutely. As one does! 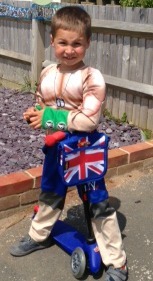 I remember the days when my boys would only leave the house dressed as a super hero! That's so nice to hear - some people give me strange looks but I know this time will pass all too quickly! Thanks - this is such a useful post. My little boys LOVES his microscooter, and has now started doing tricks involving stamping down on the back brake, so I'm worried it will give way at some point (he's copying the older boys on their big steel scooters doing tricks!) I didn't know about the recycling scheme either - that's very useful to know. Oh wow that is really good - because believe me, I know how much boys end up needing spares and repairs for these types of things. That's so great you received a new one. I love their incentive of sending off old ones to Africa. And I so agree, best form of discipline - take away the most beloved possession! X.